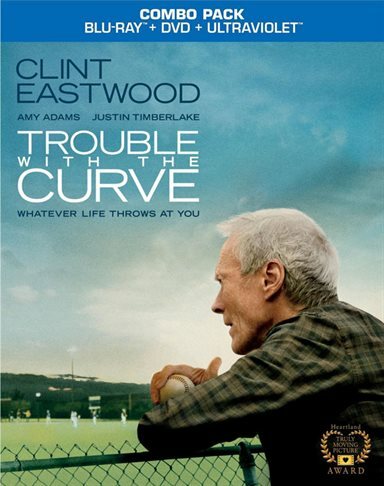 Trouble with the Curve is a neat 'n tidy counterpoint to the much better film Moneyball, bemoaning the long lost art of baseball scouting over the cold, faceless statistics of major league number crunching. The movie's story offers gruff romanticism over game-changing mathematics. Family drama over closed door shake-ups. And a very different love of the game; one that lives for the narrowing of an eye, the soft crunch of dirt beneath a pair of cleats, the sizzle of a pitch, the crack of a bat connecting with a ball or the sharp thwump of a catcher's mitt cradling a strike. Director Robert Lorenz, Clint Eastwood's go-to executive producer and assistant director for the last fifteen years, isn't fresh off the bench either, and Eastwood, Amy Adams, Justin Timberlake and John Goodman all turn in fine performances. The first-time feature film director does make a few rookie mistakes, though, assembling a heavy handed supporting cast, resting his hopes on a shaky third act, and refusing to bench a grizzled old sports movie veteran that should have retired thirty years ago: melodrama. Ailing Atlanta Braves scout Gus Lobel (Eastwood) isn't getting any younger. His eyes are getting progressively worse, his stubbornness is souring and the team's GM (Robert Patrick) is starting to heed the advice of a shrewd statistician named Phillip Sanderson (Matthew Lillard) who's gunning for a job in management. Unbeknownst to Gus, though, his latest scout may be his last, if Sanderson can prove his approach is superior. Worried, Gus' friend and colleague Pete Klein (Goodman) turns to Gus' estranged daughter Mickey (Adams), a talented attorney on the verge of becoming a partner at her firm, and asks her to check in on her father. Mickey is reluctant to intervene, but soon finds herself by her dad's side, where she reconnects with a love of baseball and slowly begins to yearn for a relationship with her father. In the meantime, she also makes a connection with Red Sox scout Johnny Flanagan (Timberlake), a former pitcher Gus himself discovered once upon a time. Pairing an old man's lament with a young woman's empowerment, Trouble with the Curve is at its best when Gus, Pete, Mickey and Johnny are at bat, and the character bits are far more involving than the baseball particulars. A dear but dusty sense of nostalgia prevails, but a deep appreciation or understanding of the game isn't required. It helps, of course, as well as childhood memories of eating ballpark hot dogs slathered in ketchup and mustard, scrambling for foul balls, erupting as a homerun ball clears the wall, stretching at the seventh inning and sitting next to your father or grandfather, listening to stories of games long forgotten and days long past. But that's every baseball movie. Curve thankfully boasts a lineup of strong lead performances. Eastwood locks in on a measure of misty eyed softness in cranky, cantankerous Gus, and makes him as inexplicably likable as an inexplicably likable old cuss can be. Adams, meanwhile, undergoes the most change on screen and is tasked with almost all the heavy dramatic lifting, the bulk of which she handles with breezy ease. Timberlake is a delight, even if his fast-talking charmer is rather manic. And Goodman, reserved but affecting, lends some much needed heart to Braves management, under-utilized though he may be. Now on Blu-ray, Trouble with the Curve doesn't have any trouble at all thanks to warm and summery cinematography which is striking, with richly saturated colors, lovely skin tones, deep black levels and finely tuned contrast. Detail is quite good too. And when it comes to audio, you can't go wrong here either. The crack of a bat. The roar of a crowd. The mumbling and grumbling of a cranky old man. All come through as clear as crystal. The same can be said for the dialogue; intelligible and perfectly prioritized without any lost lines or muffled voices. Only two short featurettes are included: "Rising Through the Ranks," which focuses on director and longtime Eastwood mainstay Robert Lorenz, and "For the Love of the Game" which takes a look at the contributions of Amy Adams and Justin Timberlake. Trouble with the Curve isn't as convincing in the scouting vs. statistics debate as Moneyball, romanticized as its affection for Gus' lost art may be. But its human drama makes up for it, even though Lorenz yanks melodrama off the bench more often than he should. Fortunately, Eastwood, Adams, Timberlake and Goodman are a joy on screen, and give the otherwise minor league film some much needed power hits. Trouble with the Curve isn't a great baseball movie, sure. But it's a decent one, with a solid lead cast to boot. What have you got to lose? Download Trouble With the Curve from the iTunes Store in Digial HD. For more information about Trouble With the Curve visit the FlickDirect Movie Database.